Note: To see previous Yemen map updates, or to check for new ones, view all Yemen posts on Political Geography Now. 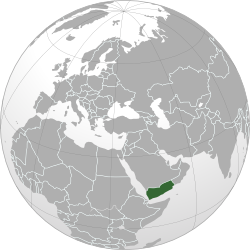 In the three months since our last Yemen update, the national army has been engaged in heavy fighting against Ansar al-Sharia, a front group of Al Qaeda in the Arabian Peninsula (AQAP) which has controlled large areas of Yemen's south since the chaos of last year's popular uprising. In some southern towns, Ansar al-Sharia has set up "Islamic Emirates" administered independently of Yemen's government, with its two most prominent strongholds in Zinjibar and Jaar (renamed "Waqar"). 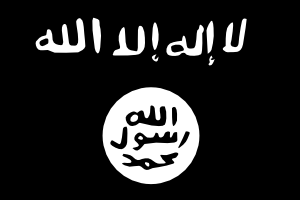 Flag flown by Ansar al-Sharia in its emirates - the war banner of Al Qaeda, based on Muhammed's Black Standard. Public domain graphic by Ingoman (source). The Al Qaeda fighters at first defied the Yemeni forces, taking new territory in Shabwah province's Rudum District, and temporarily capturing an army base in the area of Mallah at the end of March. They have also gradually expanded operations into Marib province and the southern port city of Aden. However, the tables began to turn in May, as the government of President Abdo Rabbuh Mansur Al-Hadi launched a major offensive against the Islamic extremists - with support from the U.S., including air strikes by armed drones. First, Ansar al-Sharia was completely driven out of the Lawder and Mudia areas, whose town centers had already been defended for many months by "Popular Resistance Committees" (community militias opposed to Al Qaeda, who also played a key role in the recent victory). Then, early this week, Yemen's army finally captured Zinjibar and Jaar, key strongholds which the militants had held for over a year. The last Al Qaeda territory in Abyan province, the port town of Shuqra, fell into government hands on Friday. The neighboring province of Shabwah remains largely under the control of Ansar al-Sharia, though none of their "emirates" there are as strategically useful as Jaar or Zinjibar. The Houthi rebels, an army of Zaidi Shiite dissidents who have been fighting the government for years, still control most of Sa'dah province in the north, and exert their power in the surrounding regions as well. They refused to put down their weapons when Yemen's popular uprising ended in February, but have agreed to join upcoming talks on the future of the country. Efforts are under way to convince the Southern Movement secessionists to join the dialogue as well. Meanwhile, fighting has sprung back up between the Yemeni military and local militias in the north of the capital, Sana'a. The districts of Arhab and Nihm, which fought in solidarity with anti-government protesters during much of last year, have once again been shelled repeatedly by the military. This action strikes a sharp contrast with President Hadi's efforts at national unity, and it has been alleged that the conflict is being waged in defiance of the president's orders by Ahmed Ali Abdullah Saleh, commander of the Republican Guard and son of the deposed former president.